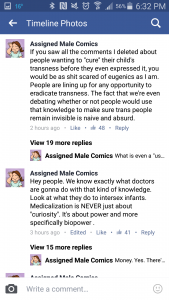 The following images are screenshots of a Facebook thread on the page Assigned Male Comics. 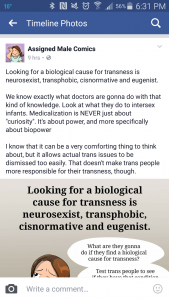 The page posted an image that spoke out against the medicalization of transgender identities through research projects that look for a “biological cause” of ‘x’ identity. The main blogger pointed out that said experiments are never simply about “curiosity” but are, instead, intertwined in systemic issues of power and biopower (first and second image). This is an interesting point of view that I have read repeatedly throughout my Facebook newsfeed, especially in relation to “prescreen” services offered to parents allowing them to terminate pregnancies based on genes thought to be markers for gay identity. However, I have also seen through different social media sites that I follow and during my research for my final paper that health care coverage for transgender and gender non-conforming individuals tends to be a very complicated process. 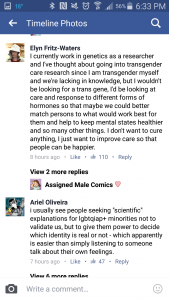 I was interested to see if scientific research looking for the “cause for transness” might have a similar backdrop. As expected, there were various commenters who were interested in such studies because they wanted to “cure” children of transness before it it was “expressed” (third image). 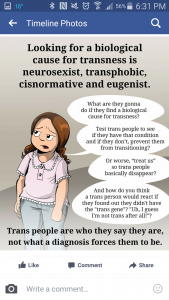 The fourth image points out a tension within the main poster’s argument throughout the comments section that biological studies on transness should not be supported. This individual informs the reader that scientific research related to trans issues sometimes improves knowledge for practitioners to provide better care related to hormones. 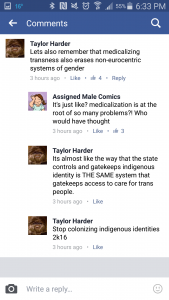 The fifth image was one of the only comments I found talking about how the medicalization of transness in the United States tends to erase non-Eurocentric systems of gender. There is a lot going on with these screenshots and Facebook page. One of my main points for dedicating a blog post to this conversation is because (1) conflicting opinions of transgender and gender non-conforming health care continues to pop up in my research and (2) social media can be a powerful tool to disseminate and produce dialogue (as we have discussed in class several times). Sidenote: Something that I would like to point out but didn’t know how to fit into the main blog post is that this thread leaves out individuals that either identify as agender or do not ascribe to systems of gender.